Success in business today is a high-wire act needing a sense of balance while moving forward in the presence of turbulence both inside and outside the company. 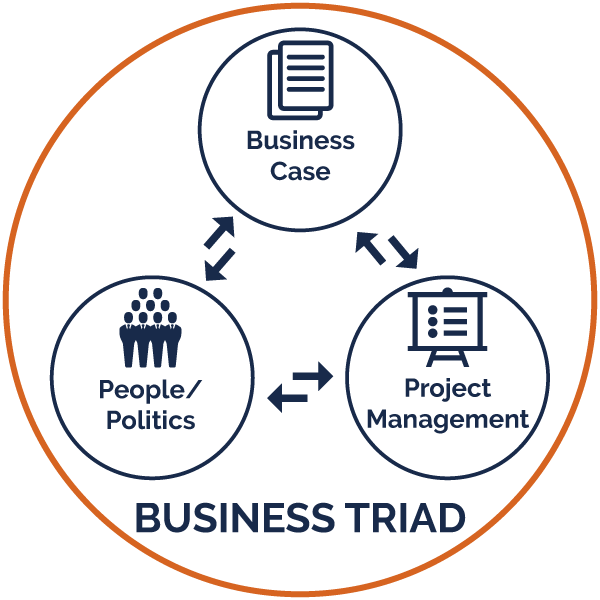 Using Center for Managing Change’s (CMC’s) unique Business Triad© you can get a clear read on your situation and work to bring it under control. Business Case and associated business processes: We work with you to insure business methods align with your strategic goals. An initial assessment of your situation is performed with the Chaos Quiz©. This assesses the stability of your business, breaking it down into nine different areas. Areas of strength as well as where improvements can be made are identified. People & Politics and associated personnel issues: CMC works with you to assess staff and determine the degree of current fit with given positions along with guidance on improving communications and performance. CMC also provides coaching as well as services for building your Human Resources functions. Project Management and the alignment of methods with goals: Project management is at the core of implementing the desired changes to achieve your business goals. Additionally, if your organization provides project management as a service or uses it routinely CMC will work with your staff to improve performance. Center for Managing Change is well aware that bringing about change requires flexibility and a range of services, including consulting, mentoring, and training. There are times when one-on-one help is needed. CMC provides that individual support. Based on your goals our consultants support you in figuring out how best to achieve those goals. CMC delivers services both on-site and virtually. In addition we will soon be rolling out value-added asynchronous training.